A nice thing about having friends who love to travel is the pasalubong they bring home. Like this can of Pastelitos de Mangga from Mamaita’s House of Sweets in Roxas City, Capiz. “Take your photos before you taste it,” Nina told me. “They’re like Pringles. Once you pop, you can’t stop.” I followed her instructions and left opening the can for the next day. I carefully took photos before tasting it. It looked really yummy, especially for someone like me who loves mango anything. Once I was satisfied with my photos, I popped one in my mouth. And another. I think I ate ten pieces before I realized what I was doing. It was exactly as Nina predicted so I quickly shut the can closed, otherwise there won’t be any left for the rest of the family to taste. I can easily demolish a can in one sitting. Unfortunately. Yes, these Pastelitos de Mangga are addictive little pieces of pastry. 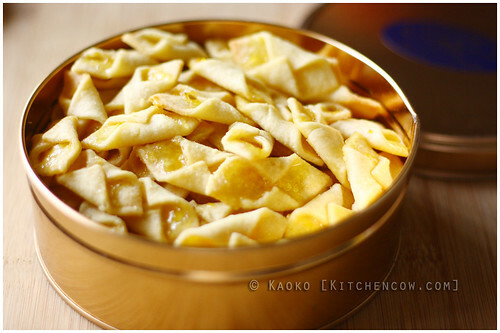 A tender pie crust-like square is folded into a dab of mango jam. It sounds simple enough right? 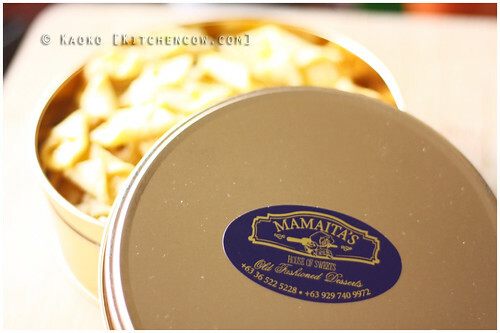 But somehow, Mamaita’s little confection is horrendously addictive. The tenderness of the crust, the hint of sweetness that doesn’t quite hit the spot so you end up grabbing the next one, plus the sunshiny goodness of Philippine mangoes made a wonderful combination. They’re like mango tartlets, only lighter, thus, more addictive. These tiny pastries are an heirloom recipe handed down in the family, so you’d be hard-pressed to find it elsewhere. Thankfully, they drop off these goodies in Manila every once in a while, so if you don’t have any plans of visiting Roxas City soon, try to call them instead. It’s definitely worth it. This entry was posted in food spotlight, food trips. Bookmark the permalink. Glad you liked it! I’m looking forward to trying out their cakes and other patries at their cafe in Roxas!